Today, a dramatic protest took to the streets of Boston to protest the presence of Arizona Gov. Jan Brewer during the annual meeting of the National Governor’s Association. Despite torrential rains, a two-mile march went from the rally site at Copley Square to the Sheraton Hotel, where the governors were meeting. March organizers estimated that over 600 people participated in the three-hour rally and march. Demonstrators came from throughout the region, with organized transportation coming from Worcester, Fitchburg, Providence, New Haven, New London, New York City, Syracuse, Baltimore, Washington DC, Philadelphia and elsewhere. The rally was co-chaired by Zaldana; Bishop Felipe Teixeira of the Diocese of St. Francis of Assisi, CCA in Boston; Marco Castillo of Unidad Latina en Acción (ULA) in Connecticut; and Frances Villar, also of the ANSWER Coalition. Speakers included Sergio Reyes, Boston May Day Committee, Rev. Claudia de la Cruz, La Iglesia San Romero de Las Americas-UCC; Mary Kate Harris, DARE (Direct Action for Rights and Equality); Katherine Diaz, Da Urban Butterflies; Ruben Miranda, Departed Diaspora; Tito Meza, Proyecto Hondureño; Vanessa Kerr, Student Immigrant Movement (SIM); Gladys Gould, La Liga Global; Tanisha Douglas, Malcolm X Grassroots Movement; Priscilla Lounds, March Forward! ; and others. 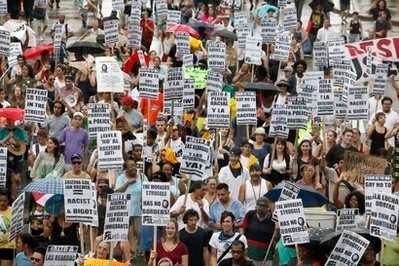 It began to rain as demonstrators started the two-mile march from Copley Square to the site of the Governor’s conference. Within minutes the storm turned into a heavy downpour as the march approached the Sheraton Hotel, passing by the location where Brewer and the other governors were meeting. Though the streets began to flood, everyone remained undeterred. In fact, the energy of the crowd intensified, and the chants demanding an overturn of the Arizona law grew louder during the dramatic two-hour-long march through the streets of downtown Boston. “Jan Brewer and other state officials in Arizona can be confident that protests will follow their every appearance throughout the country. Immigrant workers and the targeted Latino community in Arizona need to know that people everywhere will stand with them in the face of racial profiling and vicious repression. The July 10 demonstration is one example but there will be many more to come,” said ANSWER spokesperson Jennifer Zaldana. “The turnout and energy of the protest in Boston today shows the level of commitment the people have to the struggle for full rights for all immigrants. Brewer claims that her racism and bigotry represents the majority sentiment in this country, but we are proving that to be a lie.